Another oldie, but goodie from The Fashion Nomad archives, this time from June 2012. 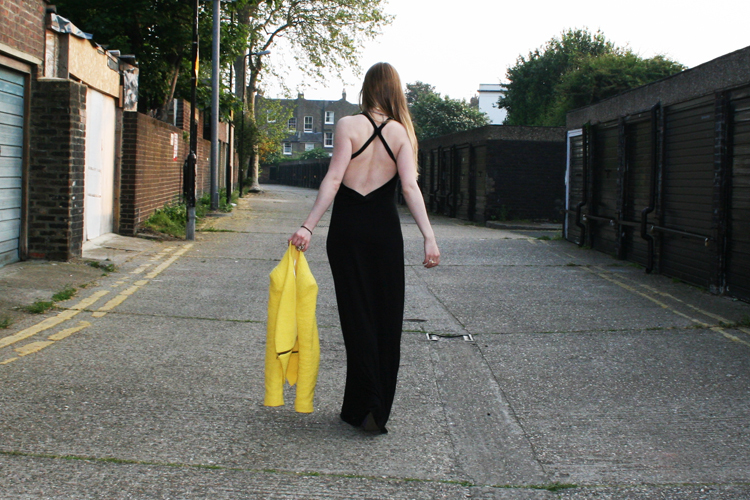 I was a big fan of this canary yellow blazer from Zara and at the time insisted on teaming it with everything from black maxi dresses to shorts and wedges. The zip details on it are amazing and the colour is so bold, but it really was far too heavy for a jacket in June. But that’s the thing with fashion, sometimes you catch yourself wearing a bikini in February and a wool jacket in June. It’s all rather crazy. It’s a wonder we bloggers don’t suffer from pneumonia half of the year and sweat ourselves silly the other half. but you suffer for the art of fashion. Love the post. A new post has come up on mine, hoping you would like it. “It’s a wonder we bloggers don’t suffer from pneumonia half of the year” Hahaha, I wonder that all the time!! Cute dress! Love the open back!